In my family, we do enjoy our gatherings. Most of us have always got on well together. I still find them enjoyable, good fun occasions. But this one took place more than 60 years ago. Just two of the people on the photo are still with us. The oldest person there is the lady on the left, my Granny Ware. Actually, she was a step grandmother and had proved herself not to be very capable of looking after her step children. But for me that was ancient history. As a kid she seemed OK to me. I’m the little lad at front left. Next to me is my cousin Anne. She’s the other current survivor. Next to her is my brother, Robin. 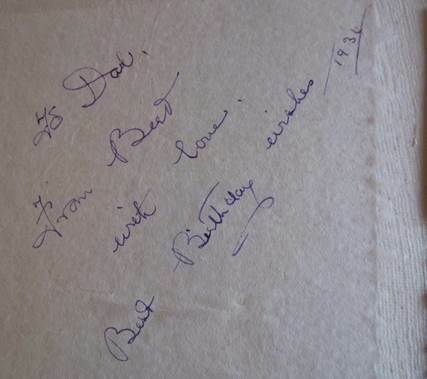 He was but 18months older than me but died back in 1980. Behind him is my mum who died in 1967 – the first of these people to go. 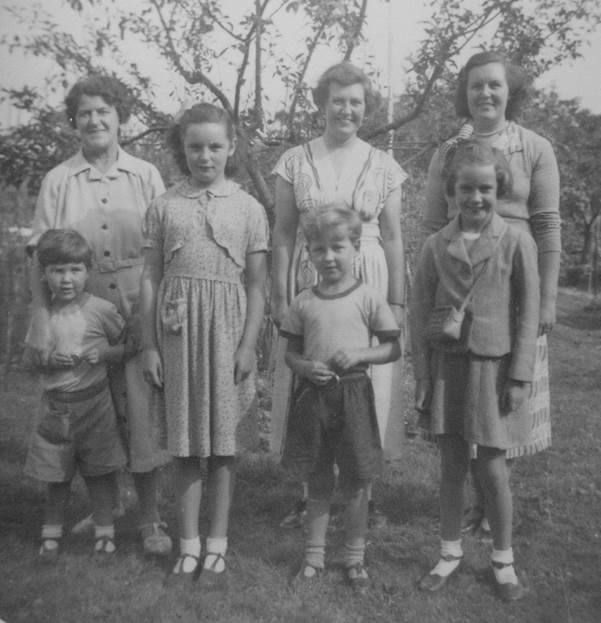 Next to her is her sister, my Aunty Vera – mother of cousin Anne and in front of Vera is my sister, Paula. This would have been a rare get together in 1952. My family were just coming out of total financial hardship back then. My father’s life, like many a man of his age, had been seriously disrupted by World War II. When demobbed from his role in the army, he decided he’d get fully educated and became a university student. It was in 1952 that he graduated and started to earn a bit of money. We didn’t travel much for travel meant rail fares. They were to be avoided. I can’t identify the location for this photo but I’m guessing this was a rare visit to Tonbridge for us. But wherever it was, it is a nice record to have. I started collecting 78RPM records back in the early 1960s. 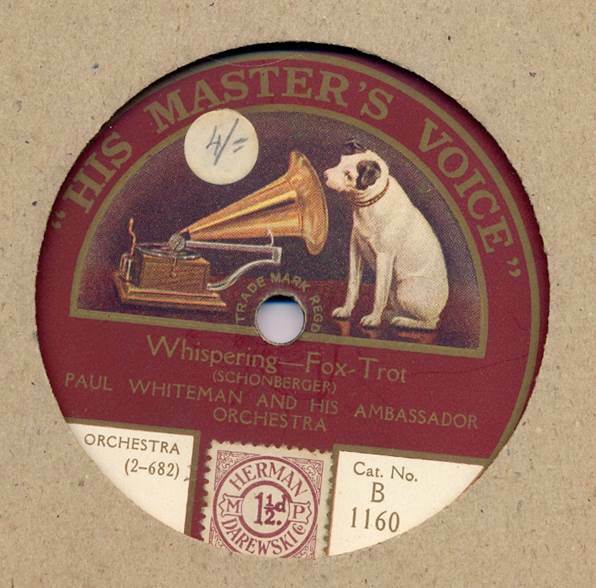 I particularly liked 1920s dance band music and Whispering, played by Paul Whiteman and his Ambassador orchestra is an early example for this foxtrot was recorded in 1920. It quickly became a firm favourite of mine. Of course, I’m horrified by the fact that a record that was a mere 42 years old when I bought it at a local jumble sale, is now a veteran of 95. I’ve owned it for more than 50 years! This is a 10 inch diameter 78 RPM record which appears to have a four shillings (4/=) price tag on it. The stamp on the record indicated that duty was paid of 1½d. That’s little more that ½p in present money. Paul Whiteman was given the sobriquet, ‘The King of Jazz’. True jazz enthusiasts probably cringe at the nickname for Paul’s music quite definitely was not jazz but rather was played, at times in a jazzy style. The think that made Whispering a real favourite was that one section has a swanee whistle as lead instrument. These were also known as slide whistles and have the benefit (or huge disadvantage) of being able to play absolutely any note. It is horribly difficult to get just the right one. 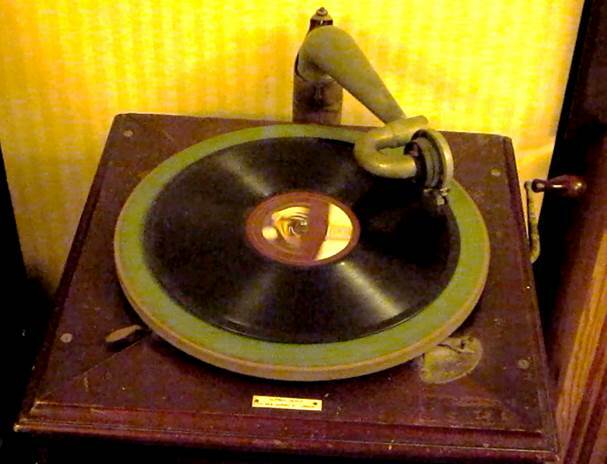 But listen here to one of my old gramophones (it also dates from 1920 so is perfect for this piece of music) playing the record. 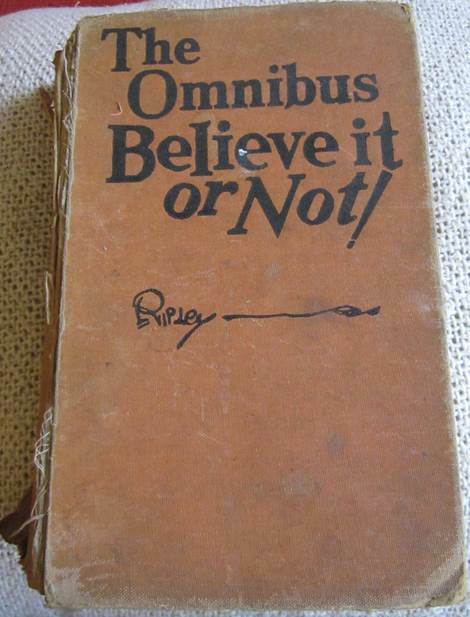 Robert Ripley (1890 – 1949) was an American newspaper cartoonist who hit on the idea of collecting strange facts from around the world which were then published in American newspapers under the heading, ‘Believe it or Not’. He became enormously popular with both radio and TV shows and I suppose it was no wonder his newspaper articles were collected into an omnibus edition. 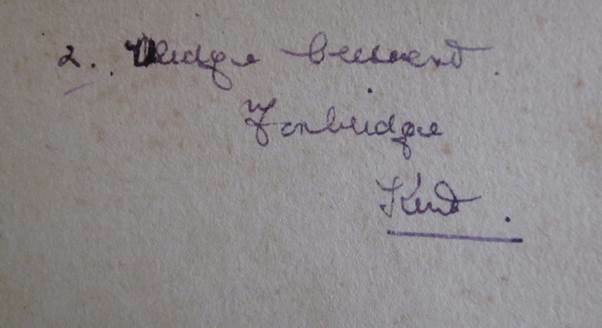 My book was given me by my grandfather, but I don’t think it was originally his. No, my grandad never had a son called Bert to give him a book like this and neither did he live (so far as I know) at the address given. I loved the book which I will have had for well over 50 years now. It suited the nerd in me being full of facts presented in short and manageable newspaper sized items. Some of Ripley’s articles are all words. Some are a mix of words with a drawing like the one below. 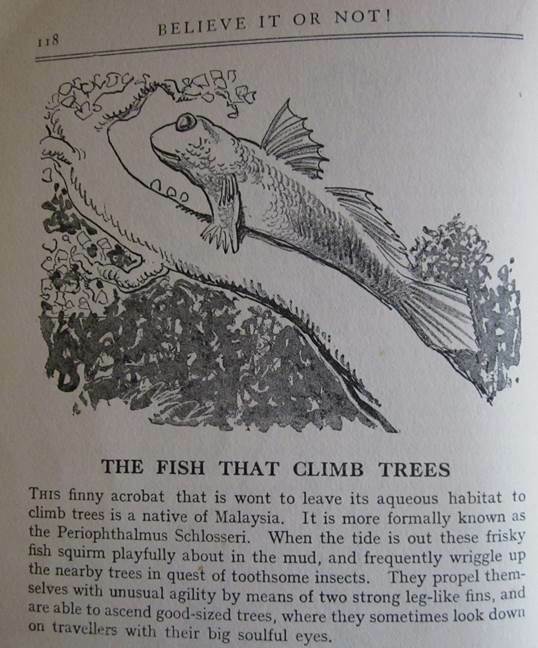 Back in 1934, when this book was given as a present, facts about the giant mudskipper would have been hard to believe. These days we are more used to such information. Some of Ripley’s items were largely based on a drawing and the facts can be strange. Now that sounds like good value! Lovely book, despite its tatty state. Thanks Grandad. The title for this piece is a phrase my dad used. Like all of us, he found he needed cash, but he was a believer that it was goods and services that really mattered. He referred to all sorts to do with cash and coinage as ‘the token economy’. 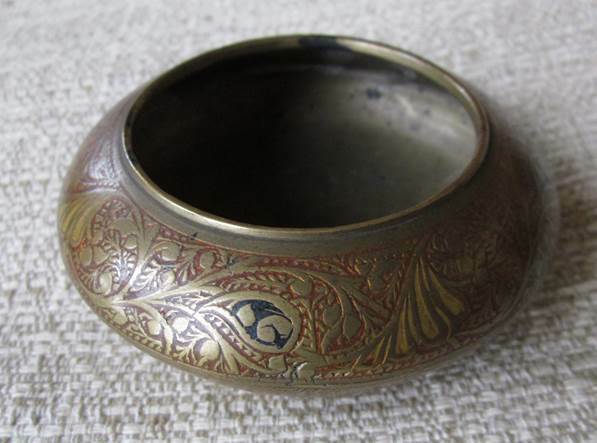 So this post will be a bit about coins and also about a pot I keep a few in. This is my little coin pot. I remember buying this at a childhood jumble sale and loving it. I’m not sure my parents thought much of it but I still rather like it. 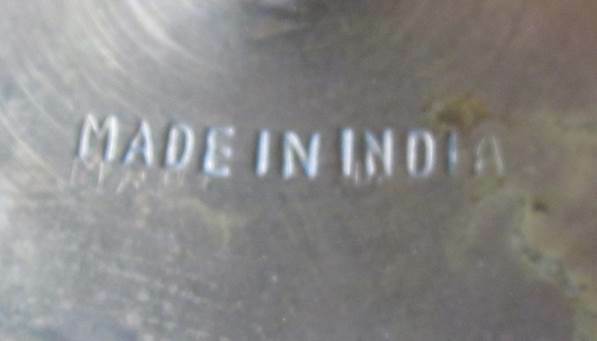 It was made in India. Inside there is an assortment of coins, gathered and kept for no particular reason. 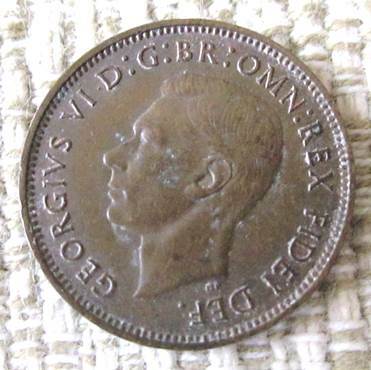 I have picked out a few old British coins which I look back on with affection. First, there are a couple of farthings. There’s a George VI and an Elizabeth II coin. These were quite small in size and tiny in value. To get a pound you needed 960 (nine hundred and sixty) of these little beauties. What made them favourites certainly wasn’t the heads side. The reverse had a delightful image on it. That wren – I loved it. 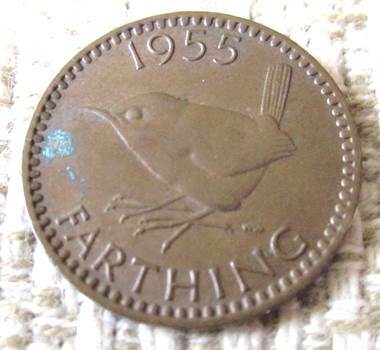 I believe the last farthings were minted in 1956 and the coin ceased to be legal tender in 1960. 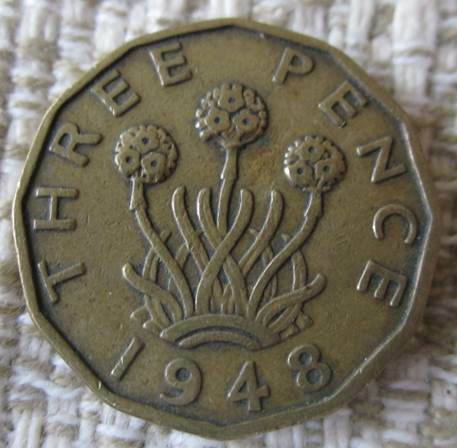 My other old favourite coin was the threepenny bit. I barely ever came across the old silver version. The ones I knew and loved were the nice chunky 12 sided ones. Again I have George VI and Elizabeth II examples. These had different reverse or tails sides and I have to say I preferred the older one. The plant depicted is thrift – an appropriate icon for coinage. 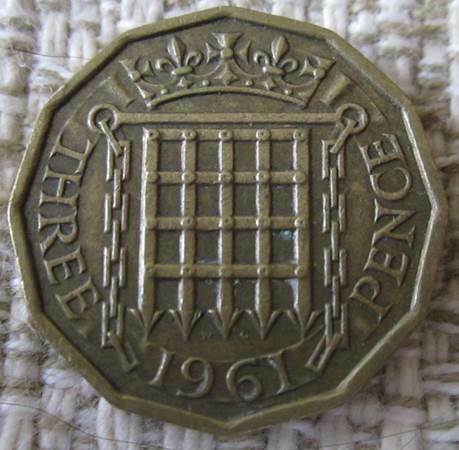 But the Elizabeth II coin shows a portcullis. 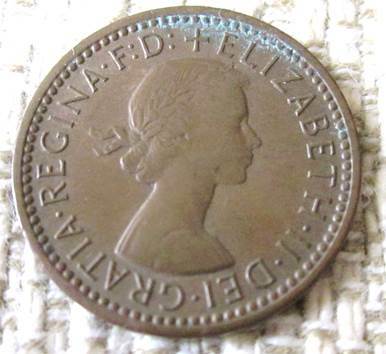 This coin was swept into oblivion with decimalization in 1971. 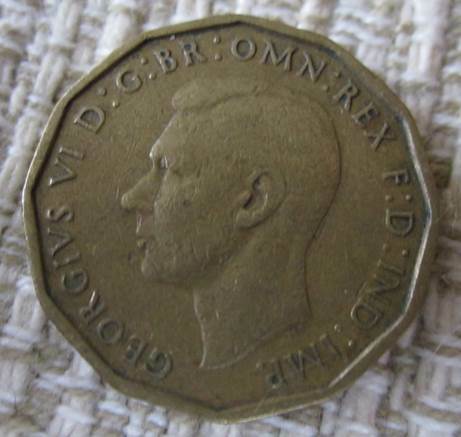 A coin worth one eightieth of a pound clearly did not fit with the new scheme. But a few coins like these do bring back happy childhood memories for me. I think a few bits of the token economy are worth keeping. Oh, there is always a chance of a bit of token value accruing. 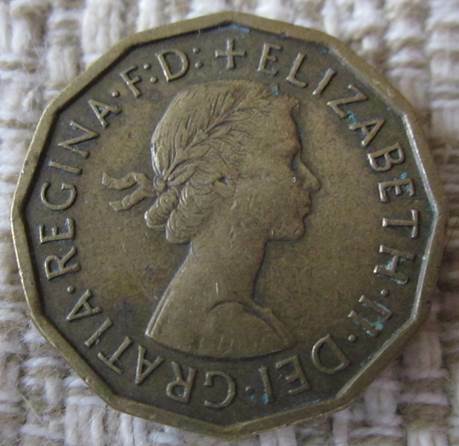 The 1948 3d coin is quite rare and it could be worth £50 if it was in mint or uncirculated condition. As it isn’t, it won’t have much value. Sad to say I have never actually set foot on the island of Hoy. It was an Orkney Island we were unable to visit when we were up there in 2004. 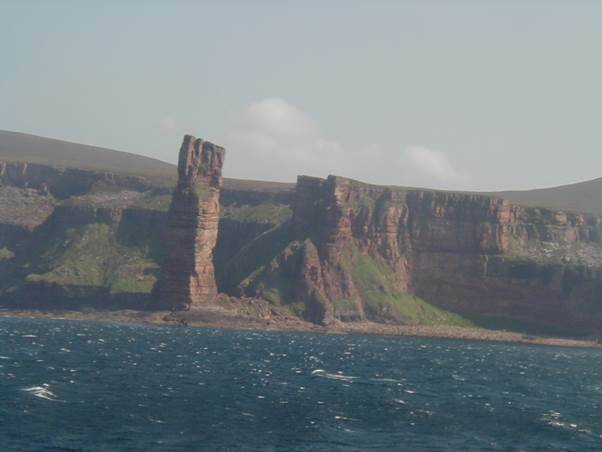 But the ferry, going from Scrabster which is near Thurso on the north coast of Scotland to Stromness on the Orkney mainland passes close by – and particularly it passes close by the sea stack known as the Old Man of Hoy. There it was on our outward journey on 9th August 2004. Now I’m no climber and I tend to think people who take up challenges like climbing the Old Man are a bit mad. It’s 450 feet high and mostly pretty well vertical. But those of us old enough well remember the televised climb back in 1967. It was adventurous television then as well as being a truly adventurous climb. It brought knowledge of this stack to 15 million viewers. So it was grand to go past it and see it. By the way, one of the televised climbers, Chris Bonnington, celebrated his 80th birthday last year by climbing it again! We passed it again on our return journey some days later. My wife was recently sorting out an accumulation of junk on top of a tall cupboard in a spare room. She came upon three containers which I must have put there aeons ago and had forgotten about. The boxes contained playing cards from my childhood days. Some of the packs are just playing cards – normal enough – but others are specific games and amongst them is a pack of Bobs Y’r Uncle cards. What happy memories they bring back. Let’s look at the back at one of the cards. The game is clearly designed with children in mind. 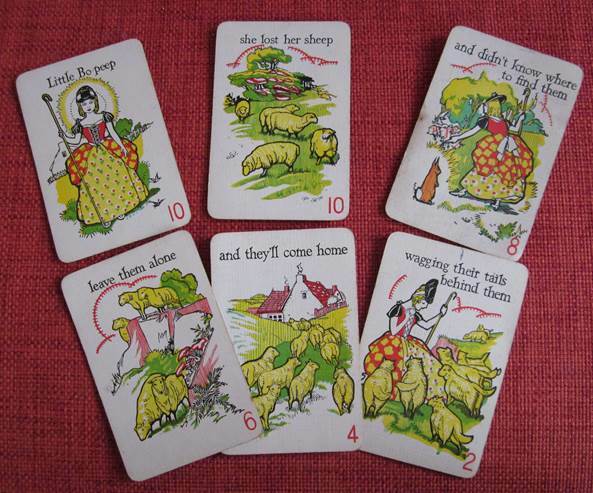 The face side of the cards (most of them) have extracts from nursery rhymes on them. Six cards are needed to make up each rhyme in a set. Here’s the set that make up Little Bo Peep. The rules are really quite complex for children who would need to know the rhymes, be able to add scores and, hardest of all as I recall, remember the importance of saying ‘Bobs y’r uncle’ at the right time. Some thought and strategy are needed as well. There are different ways of winning. 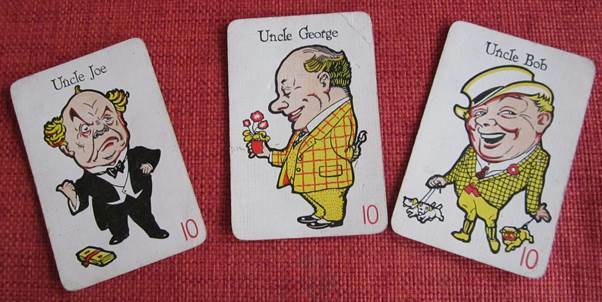 One way was to place all of your cards correctly and another was to get the three uncle cards into your hand. There are also three little boy cards and you can win by collecting all three of them. These cards are now deemed so politically incorrect that even I am not prepared to show them. No doubt in the 1930s, when the game was first produced, they would not have been deemed offensive. I remember playing the game as a child. 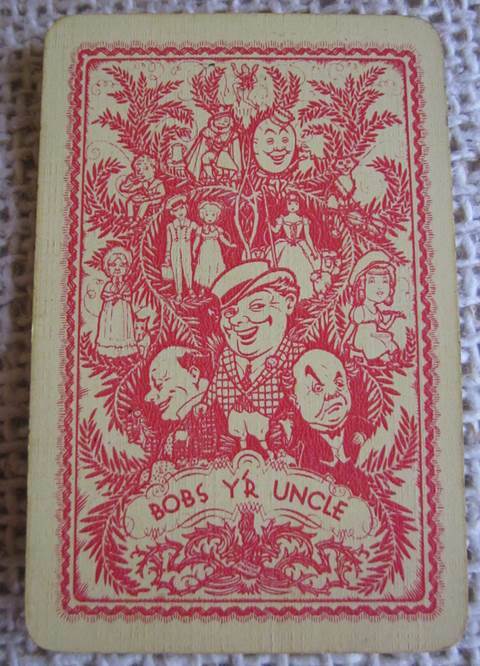 I also recall that in my family after someone had said, ‘Bobs y’r uncle’, we had a correct replay which was, ‘and Fanny’s your aunt’. I have no idea why we said this, but it certainly was said by all three generations of us who played the game. I could be tempted to try the game with my grandson now but I’d foresee difficulties. Like all kids find (including me back then) just holding cards is hard. He may not know the nursery rhymes although he’ll know a plethora of equally OK other songs. But we might have a go. Maybe I could hold the cards and he and I could be a team. You can find more about this game including a full set of rules on the Victoria and Albert museum website at http://collections.vam.ac.uk/item/O26679/bobs-yr-uncle-new-card-card-game/ . Back in 1994 – 21 years ago – we took the family camping in South Brittany. We found a quiet farm camp site at a place called Breventec about seven miles from the coast and something similar to the magnificent standing stones at Carnac. 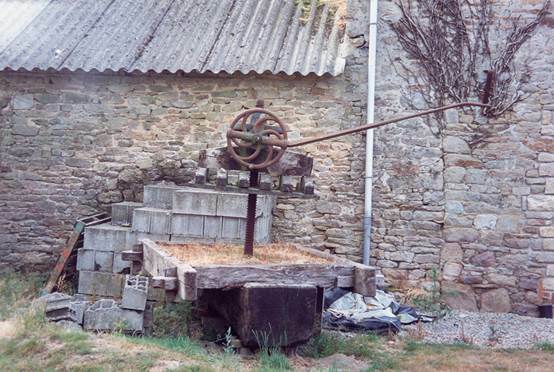 Breventec had odd bits of old agricultural kit about the place and amongst them was this cider press. The principle is simple. Apples are placed on the straw held in by the hefty wooden frame. 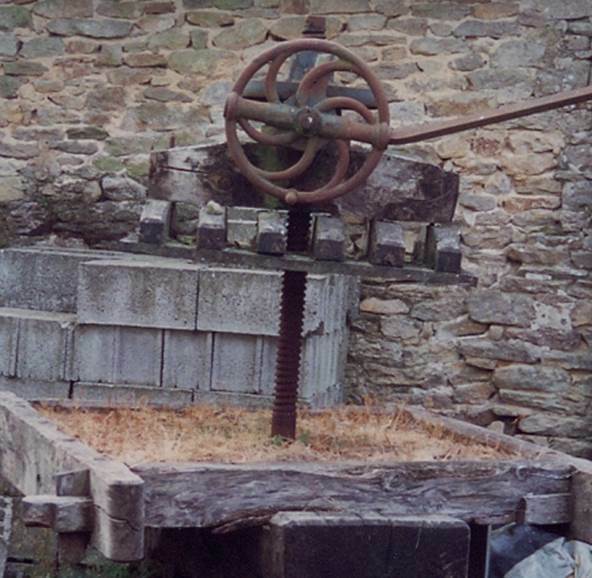 The bit under the metal wheel – it looks a bit like an upside down pallet – is lowered by turning the wheel around. The apples are crushed between the two surfaces. The straw acts like a filter or sieve. Only juice falls into the trough below from where it can be collected and fermented to produce cider. I’m guessing someone has placed an extension handle on the wheel to enable real pressure to be applied so that every drop of juice is obtained. Now that was just the kind of device to keep me happy all those years ago. Perhaps the title should really be a family perambulator or pram for short. 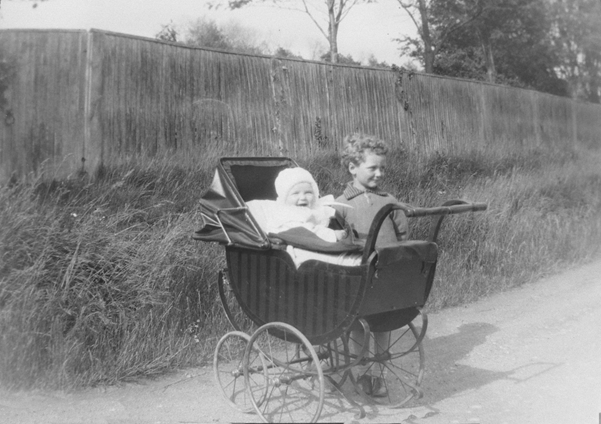 I’m guessing from his age that the baby in the pram might be his sister – my Aunty Dora – who was born in 1923. It is often hard to recognise a baby so it could be almost anybody else, but the ages look to be about right. But really, it is the pram that is the star of the show. I couldn’t be certain, but it appears to have some kind of basket work side and of course it is mounted on those big bow springs to make sure baby had a smooth ride. I just don’t see prams like this anymore. 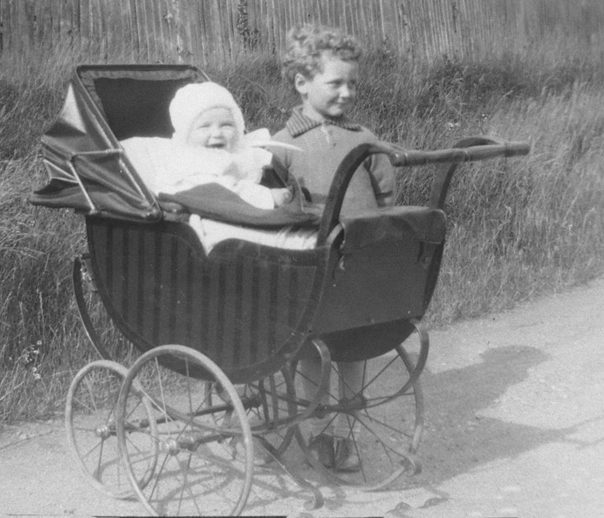 They are completely incompatible with cars and as most people have cars, big prams like this have been consigned to history (or to very wealthy people) in the last forty years or so. What a lovely photo this is. I only have a negative so there is no caption, but well done Grandad who took the shot. What strange things turn up when you decide to have a sort through old tourist leaflets and brochures. Amongst our rather overblown collection was this flyer from 1974. 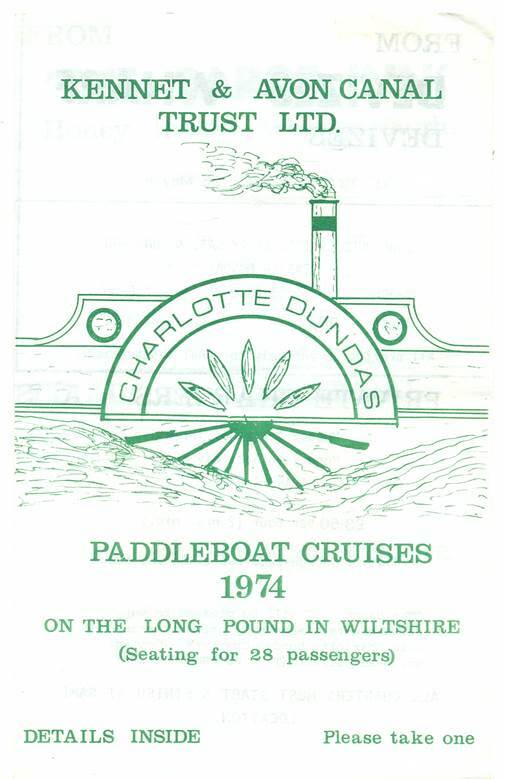 Regular blog readers might recognise that named paddleboat, Charlotte Dundas. Back in those 1970s we used to be one of the volunteer crews who took folks for trips on this rather quaint old vessel. She has appeared before on this blog. Click here to see it. But back to that 1974 flyer which really does make the past sound like a foreign country. Open up the flyer and this is what you see. For most of the season Charlotte Dundas operated from Honeystreet. In fact another earlier post on this blog shows the boat there and you can click here to see that one. The canal was much more what people wanted there. In all honesty it was a tad dull through Devizes, sunk in quite a deep cutting, but Honeystreet offered a bit of canal side industry and lovely open views of downland and the Vale of Pewsey. The flyer has been pen altered and it looks as though four one hour trips were offered. But just look at that price of 30p. It sounds absurdly cheap but in real terms it equates well with the £6 hour and a half trips from Hungerford on an altogether classier trip boat. 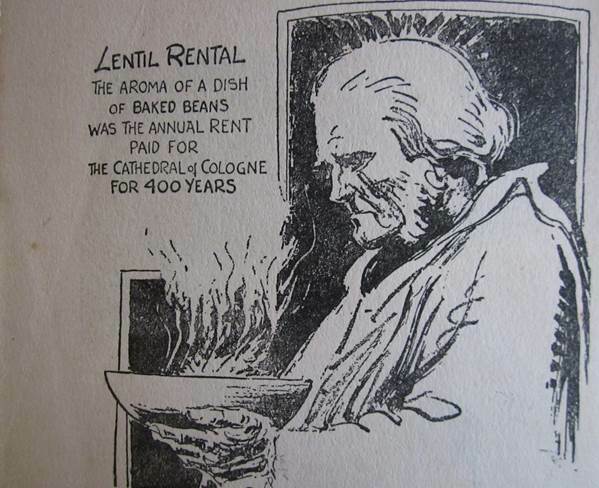 We also have the same flyer for the following year – 1975. 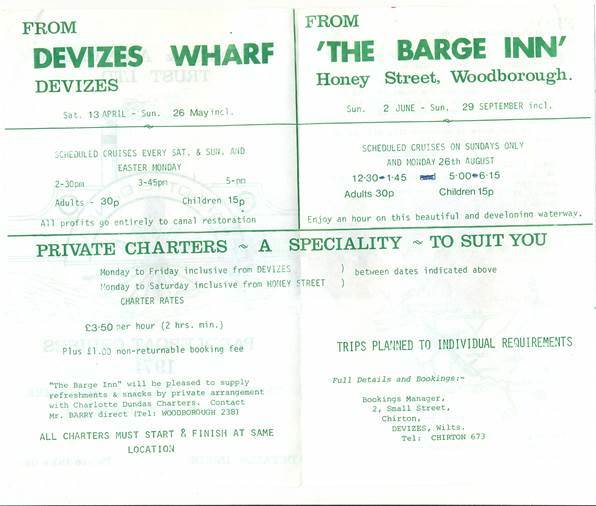 Inflation was rife back then and a swingeing 25% increase in fares had been made – 40p for adults! Groups could hire boat and volunteer crew for a two hour trip on a summer’s evening as well. I used to love doing those trips. 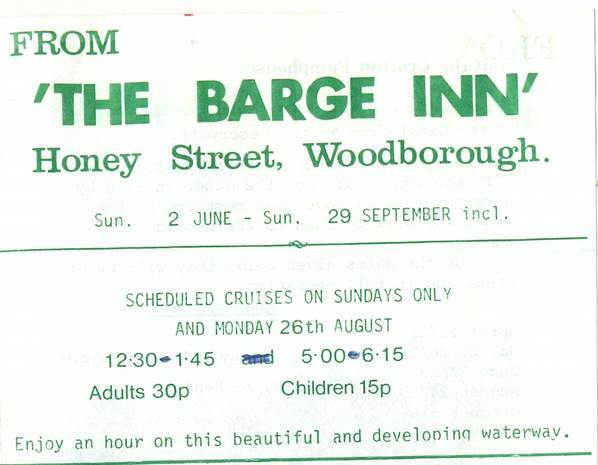 The groups were always fun and two hours allowed one to get to Ladies Bridge before returning the group for refreshments at the Barge Inn at Honeystreet. And of course, the plants begin to respond to the improving temperatures and illumination by putting forth their flowers. 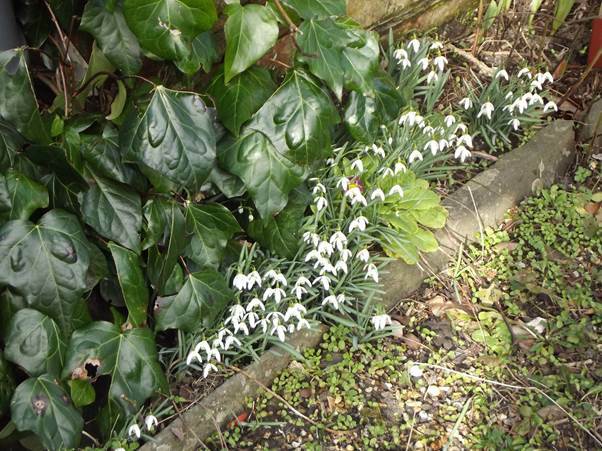 Here’s a little survey from my own garden of that wonderful spring regeneration. 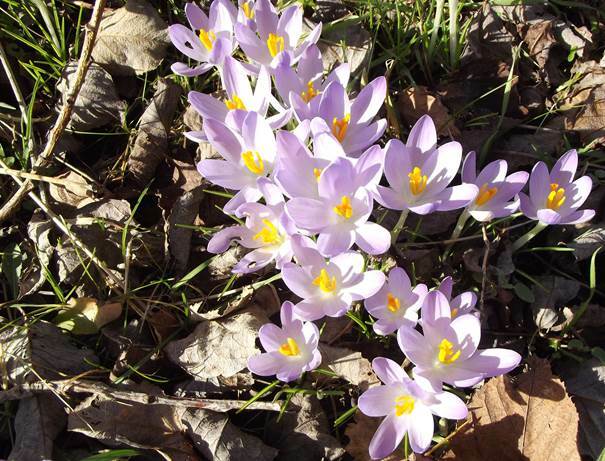 The flower of the moment is the crocus. 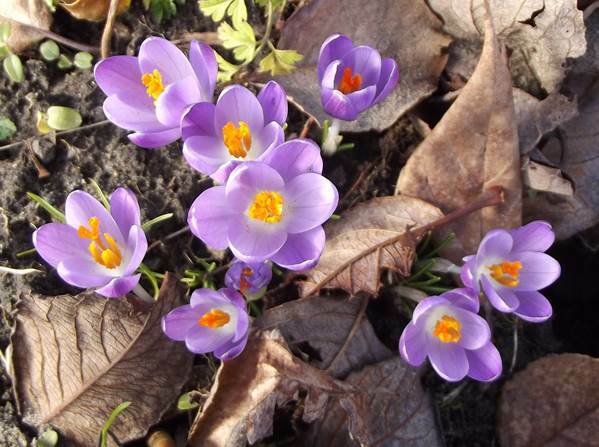 In our garden it often seems to be the purple fellows that do best. These are a lighter shade of purple and below a slightly darker shade. We also have the bright yellow beauties. And three years ago we planted some white crocuses for our daughter’s wedding which was on a similar glorious February day. 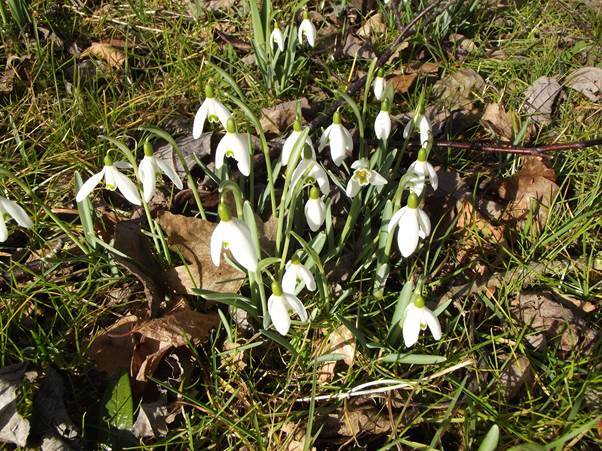 And whilst on the white flowers, we have our drifts of snowdrops. The rather classy and showy camellias are about to burst out of their buds. Various different trees and shrubs are showing their colours. 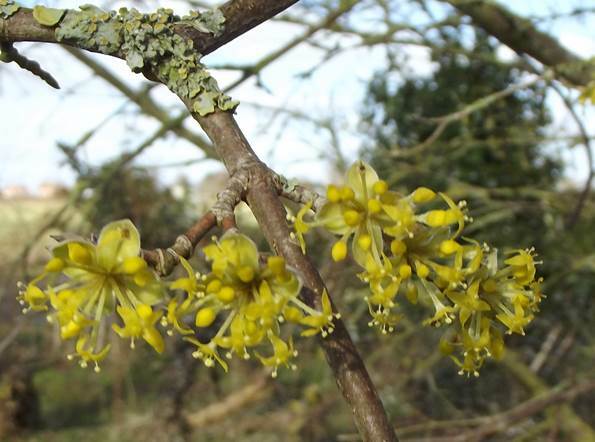 It’s catkins on the garrya and strange frond like blossom on a witch hazel. There are always plants I can’t identify. I’ll return to earth for a finish with the flower that probably draws the biggest emotional response from me and that’s the primrose. My mum was born, married and died in primrose season and she loved this flower so I always associate it with her. Like mum, the primrose seems so gentle and delicate.